Really honored to be featured along side Infront Webworks CEO "Matt Palis" in Colorado Springs Business Journals May 5th, 2017 addition. Check out "Infront stays ahead in digital world". 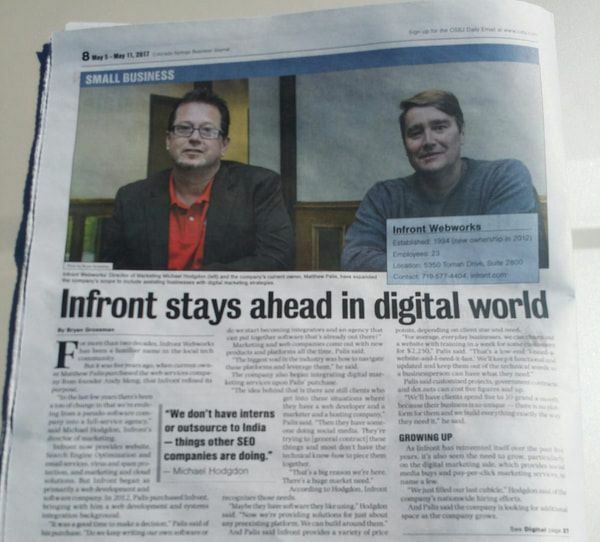 Great article by the Gazette February 20, 2017 outlining the tremendous growth the Infront Webworks SEO and Digital Marketing Team has seen over the last 4 years. 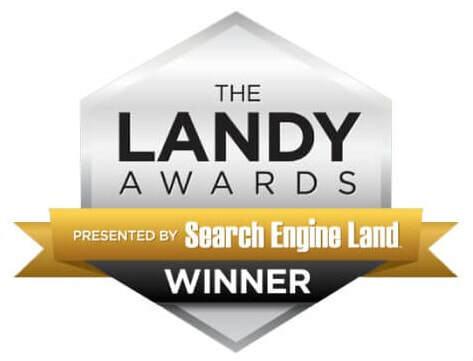 Growing the department over 704% in just 4 years, wining multiple Digital Marketing, Website Development and SEO awards during that period and building a solid team of SEO experts from across the country. The Local Search Association (LSA) asked 50 experts for 2017 predictions for the local search landscape. 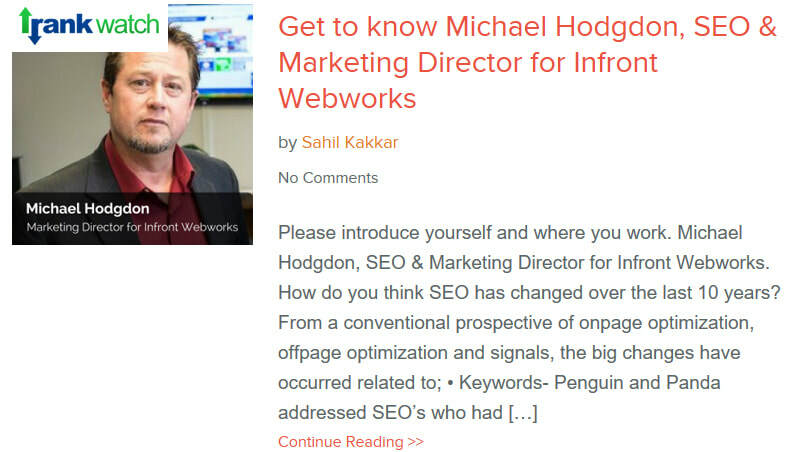 Myself and some of the SEO experts at Infront Webworks were among the participants. Infront Webworks team ranked #1 Website Development & online marketing company in CSBJ's book of lists. 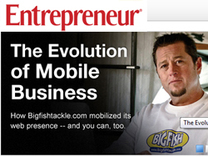 Colorado Springs Business Journal selects Infront Webworks as "Largest Website and Mobile Development Company". 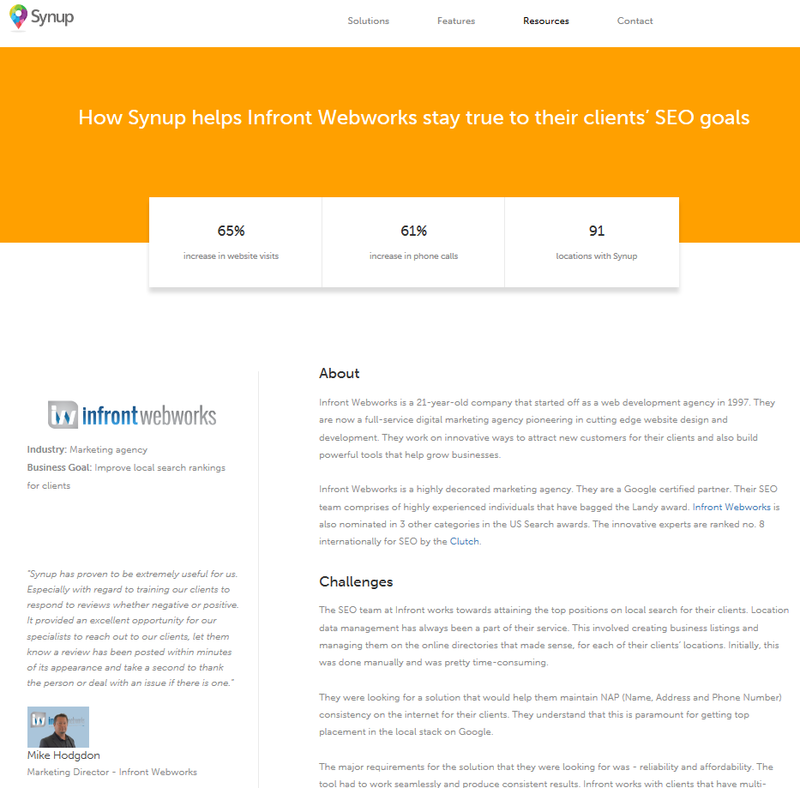 Infront Webworks SEO team selected for Googles GYBO "Trusted Business Verifier Program"
Infront Webworks Marketing and SEO Team selected for Google's "Get Your Business Online" program. Mobile applications redefined the user experience but represent only a pit stop in the continuing evolution. Featured in 2006 MMA Newsletter. "The Internet has allowed us to provide anglers with an unprecedented information and resource platform," said Mike Hodgdon, VP Operations, Predatorial Advertising Associates. "The .mobi domain takes our ability to provide anglers with the most accurate, beneficial and timely information to a whole new level. " bigfishtackle.mobi has already received feedback for text message alerts, mobile versions of online fishing games and a buddy list to send pictures of big catches to friends.